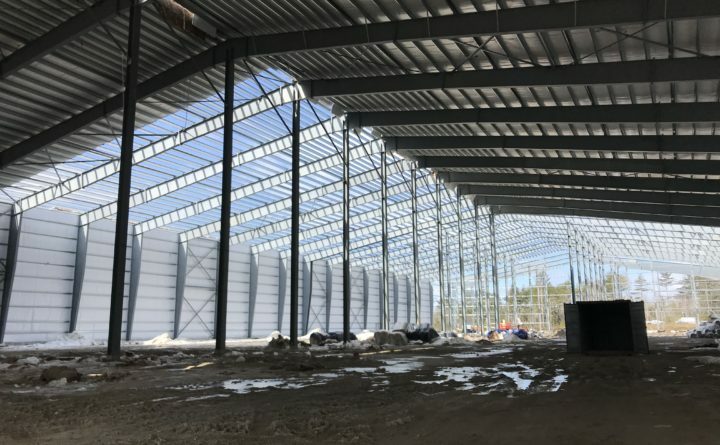 The Fiberight solid waste processing facility in Hampden, still under construction, did not meet its April 1 deadline for opening, which means waste from more than 100 Maine communities will be diverted to landfills in the meantime. The 144,000-square foot Fiberight facility will be able to process up to 180,000 tons of solid waste each year, diverting 80 percent of rubbish from landfills. The back of Fiberight solid waste processing facility in Hampden, where trucks will unload waste. 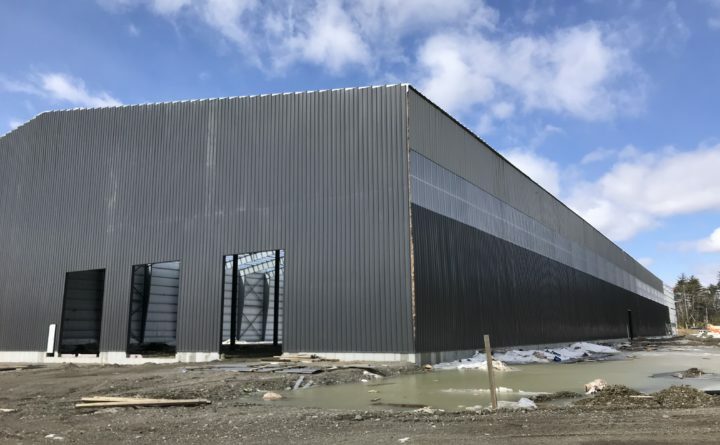 The solid waste processing and recycling facility that was slated to open April 1 in Hampden could take months longer to be operational, meaning that trash from 115 municipalities will meanwhile be dumped in landfills. Construction of the $69 million Fiberight facility off Coldbrook Road has taken longer to finish because of winter storms, Maryland-based Fiberight CEO Craig Stuart-Paul said Thursday. “If we’d had a mild winter, we would have had the building under roof by January, and the recycling equipment would have been installed commencing March. But we had anything but a mild winter,” Stuart-Paul said. The appeal by a competitor of state permits issued to his company also slowed down the facility’s construction last summer, he said. Though he told Maine Public in October that plans were on track for an April 1 opening. Most of the communities that will use Fiberight’s facility previously sent their trash to Fiberight’s competitor for the contract, the Penobscot Energy Recovery Co. The finished facility will allow member communities — including Bangor, Brewer and Hampden — to process organic waste into biofuel. Non-organic materials, such as glass, metals and plastics, will be removed and sold. Leftover fibrous material will be reused to make fuel pellets for heating. But in the meantime, tens of thousands of tons of waste, including organics and some recyclables, will be diverted to nearby landfills. The Municipal Review Committee, which represents more than 180 municipalities in central, northern and Down East Maine, decided to end its contract with Orrington-based PERC to work with Fiberight and build the new 144,000-square-foot facility in 2016. Construction began in July with the goal of an April 1 opening. In late January, Stuart-Paul said his company had secured the necessary funding for operations to begin in May. The majority of waste from MRC municipalities is being sent to either the Juniper Ridge Landfill in Alton, or the Crossroads Landfill in Norridgewock, at $70 per ton. Fiberight has also entered into an agreement with Casella Waste to set aside any recyclable items it collects to be recycled at the Fiberight facility, once it’s up and running, Stuart-Paul said. He wasn’t able to provide a specific date for when that would be. In a March 28 memo, Lounder told participating communities that the new Fiberight facility wouldn’t be able to accommodate waste for up to another six months. “We appreciate your patience and support while we reached an interim MSW delivery resolution,” Lounder wrote. The new waste delivery plan went into effect on April 1. Stuart-Paul requested a one-year permit for Juniper Ridge to “accept at least 81,800 tons” of municipal solid waste from MRC communities, according to a March 29 letter to the Department of Environmental Protection. Stuart-Paul told Project Manager Kathy Tarbuck the plant will be fully functional by the end of the year. In 2017, MRC communities produced 108,000 tons of waste, Lounder said. If that amount is diverted to a landfill for one year, it will make up a third of the waste Fiberight said it would divert from landfills in its first 15 years of operation. “We’re all quite anxious, as are all the project participants, to conclude the interim period as quickly as possible, and to be delivering to the facility as soon as possible,” Lounder said. At the unfinished facility on Thursday, crews continued working. 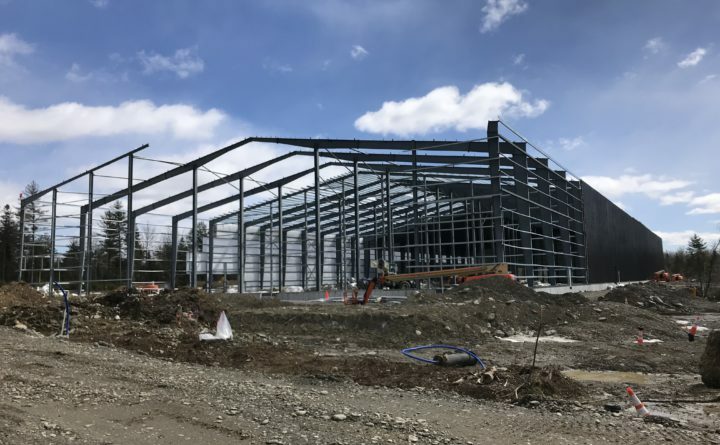 The siding and roof on the structure are two-thirds of the way completed, and in the next two weeks, the concrete foundation will be poured, said Alan Iantosca, vice president of engineering and projects for Fiberight. Once the roof is finished and the concrete dries, the recycling equipment will be moved inside, all of which are contingent on weather, said Stuart-Paul. “Weather permitting, we’ll have these things done by the end of the year,” he said.